You are buying Abbott Pedialyte Ready-To-Feed Retail 1 Liter Bottle Bubble Gum Each, model #51752. ADW Diabetes offers a complete line of dietary supplements for both children and adults. The Abbott Pedialyte Ready-To-Feed Bubble Gum Flavor 1 Liter provides therapeutic hydration that replenishes vital minerals and nutrients lost during diarrhea and vomiting to help prevent dehydration in infants and children. It is also for maintenance of water and electrolytes following corrective parenteral therapy for diarrhea. 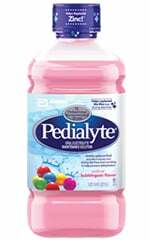 Pedialyte is designed to promote fluid absorption more effectively than common household beverages like sports drinks, juice or water. No mixing or diluting is necessary or recommended for the liquid products. Abbott Pedialyte quickly replaces vital minerals and nutrients lost during diarrhea and vomiting to help prevent dehydration in infants and children; for maintenance of water and electrolytes following corrective parenteral therapy for diarrhea. For use under medical supervision for the dietary management of dehydration during diarrhea and vomiting. Promotes fluid absorption more effectively than common household beverages. Unflavored liquid available for young infants. Great-tasting flavors to help enhance compliance in older infants and children. Reclosable plastic liter bottles allow easy measuring and pouring. Low osmolality (270 mOsm/kg H2O for flavored; 250 mOsm/kg H2O for unflavored). Water, Dextrose. Less than 2% of the Following: Citric Acid, Potassium Citrate, Salt, Sodium Citrate, Artificial Flavor, Sucralose, Acesulfame Potassium, Zinc Gluconate, and Red 40.